It's a modern filmmaking technique that's been used in big-budget Hollywood features for years now, but a Harvard comp-sci student has developed software that does digital face replacements without the need for a skilled effects artist, reducing its cost. Using footage from a locked off single camera and a simple lighting setup, Kevin Dale's face transplant software starts by creating a 3D model of the donor and recipient faces. 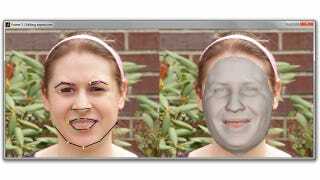 Depending on the footage the software is able to do this autonomously, but it can be assisted and tweaked by adding facial markers in its UI. Once the models are created, the program automatically morphs the donor face to match the shape and position of the recipient, ensuring that the seams around the original face blend as smoothly as possible.